Spring is the season of change. So, maybe you’re thinking about transitioning to homeownership? If so, congratulations! Buying your first home is one of the most exciting experiences of your life. However, it can also be one of the most overwhelming experiences. This Sunday, March 31 you can get your questions answered at a special Home Buying 101 class with KB Home at Meadows Villas in The Meadows at Historic Castle Rock. This intuitive class will cover everything you need to know about making the important decision to move into home ownership. Owning vs. Renting: You’ll learn about the pride you have when you’re putting your money towards your own investment rather than someone else’s. Financial Benefits: You’ll discuss the economic benefits of buying a home this spring. Affording a Home: You’ll learn about the factors that mortgage lenders look at when determining how much you can afford. Steps to Homeownership: You’ll explore the various steps you must take to when trying to buy your first home. In addition to learning about the home buying process, you’ll learn a little about KB Home options in The Meadows community. The KB Home Meadows Villas feature five floorplans located in The Stewart Park neighborhood of The Meadows. Choose from spacious 3-6 bedroom, maintenance-free homes. Learn more about the KB Home options in The Meadows. 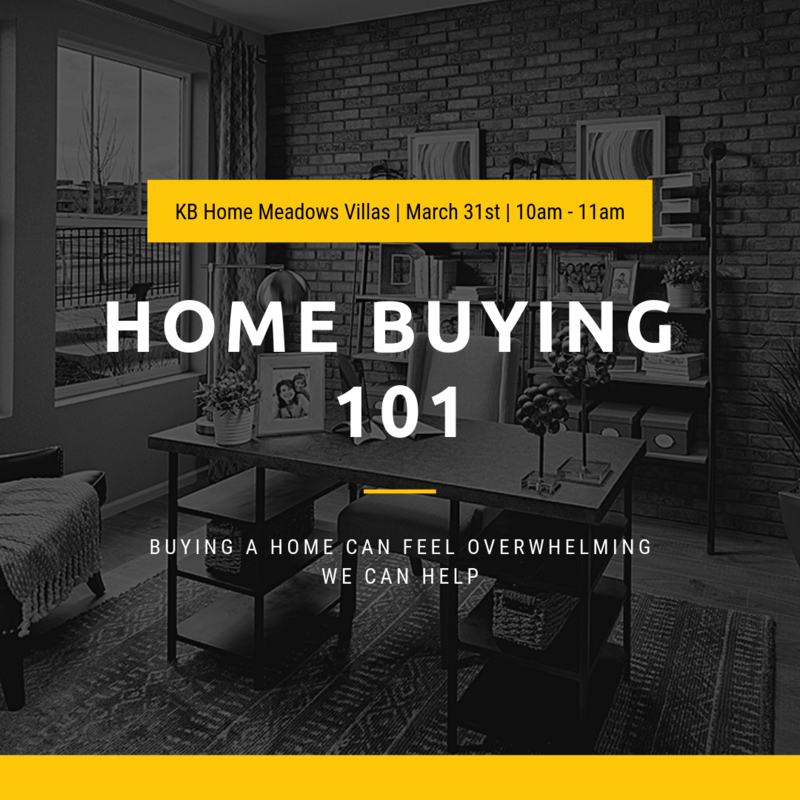 If you have questions about buying your first home, or just want to explore a few great home options here in The Meadows, don’t miss this informative Home Buying 101 event at KB Homes Meadows Villas. It will help you make the best decision for your future. Learn more about the event and RSVP.